Blackwater shows there’s nothing special in the nature of Americans. 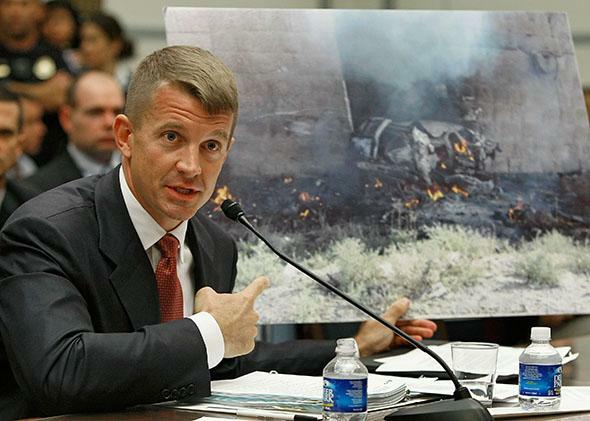 The Blackwater scandal shows the U.S. isn’t immune from behaviors we abhor in others. Blackwater was founded 17 years ago by Erik Prince, a former Navy SEAL. Two years ago, in a speech to the Wisconsin Faith and Freedom Coalition, Mitt Romney accused President Obama of lacking faith in American exceptionalism. Romney recalled that as a businessman traveling the world, “I just knew inside I had a special gift no one else had. I was American.” Part of the “special nature of being American,” Romney argued, was our selfless habit of liberating people around the world. “It’s something we all share,” he told the crowd. No, it isn’t. There’s nothing special about our nature. The latest evidence of this is a trove of documents released in the Blackwater scandal. On Sept. 16, 2007, Americans working for the security contractor shot and killed 17 civilians in Baghdad’s Nisour Square. Under investigation, the guards’ excuses have crumbled. Now, the State Department has relinquished internal reports that expose the extent to which Blackwater and its employees ran amok. Insulated from government supervision, the company degenerated into a militia. Blackwater was founded 17 years ago by Erik Prince, a former Navy SEAL. When the U.S. went into Afghanistan and Iraq, Blackwater picked up a lot of business, providing security to diplomats and intelligence personnel. The company’s project manager in Baghdad, Danny Carroll, was another former SEAL. The feds loved Blackwater’s ruthless, violent efficiency. Whatever needed to be done, Blackwater would do it. But Blackwater didn’t work like the Navy. It was a contractor, not a government agency or military service. An internal State Department memo, filed in August 2007 by Jean Richter, a special agent for diplomatic security, described the “hands off” manner in which government officials who nominally supervised Blackwater actually deferred to it and approved invoices without question. Shielded from oversight, discipline broke down. State Department investigators found that Blackwater had skimped on its protection of diplomats, outfitted its personnel with unauthorized weapons, falsified work reports, and overbilled the government. Low-wage foreign workers, supplied by a company affiliated with Blackwater, were subjected to wretched living conditions. Shortly before the Nisour Square debacle, Prince instructed Blackwater employees to recite and sign a military-style oath. But the logo on the oath wasn’t Uncle Sam’s. It was Blackwater’s. In this respect, Blackwater calls to mind the Islamic State in Iraq and Syria, which began as a non-state actor and now imposes its own pledge of allegiance. What made the conversation notable, however, was Carroll’s warning to the inspectors. According to a reconstruction of the conversation, written by Thomas immediately afterward, Carroll told Richter: “I could shoot and kill you here in Iraq, and no one would do anything about it, because that’s the way it is here.” When Thomas asked Richter whether Iraq was “like the OK Corral,” Carroll said it was. “No one here cares,” said the Blackwater man. Three days later, the regional security officer for the U.S. embassy in Baghdad kicked out the two State Department inspectors. He called Richter and Thomas “unsustainably disruptive to day-to-day operations” and alleged that they “created an unnecessarily hostile environment for a number of contract personnel.” The documents don’t clarify who talked to whom. But in the conflict between Blackwater and its investigators, the embassy sided with Blackwater. Richter reported what he had found, but the State Department did nothing. The Nisour Square shootings happened two weeks later. Now that Richter’s memo and related documents have been released, the debate has turned to what the State Department knew about Blackwater, and why it failed to respond before the fatal tragedy. The enduring lesson, however, is about human nature. Blackwater was staffed by Americans. Many of them came from the U.S. armed forces. Nothing in their DNA or their military service guaranteed their virtue. Stripped of supervision and transplanted to Iraq—where, as Carroll put it, “no one cares”—some of them absorbed the nihilism of their environment. They cheated, stole, exploited, threatened, and killed. Their story is much like that of Abu Ghraib, where American discipline collapsed even in the uniformed military. What makes America great isn’t something marvelous in our nature. It’s our rules and our mechanisms of accountability. If I were to shoot and kill you, someone would do something about it. That’s the way it is here. And that’s the way it has to be, wherever we go.